Hows things going with you? That's a pretty impressive crop. Were they grown in polytunnel? Had our first carrots tonight. Beetroot been ready for a couple of weeks. Runner beans flowering well. Onions are outside and went in late due to the non existent spring, so they have a long way to go. Spuds too. sown twice so far and no germination. Indoors, carrots coming nicely; tomatoes, cucumbers, cauliflowers, calabrese, french climbers, peppers, squashes all doing well. Eating lettuces, chard, spinach, beetroot, scallions, kale. Good stuff lads. 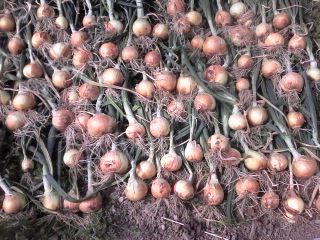 The onions were a Dutch overwintering variety (lost label), they were planted in the poly last September as were the Garlic. What is in the polytunnels are looking good but outside is a different story. We picked our first crop of early peas yesterday, I will get another picking before replanting for a later crop. Spring cabbage are good and we will have to take some to the mart before they go over. I only do one planting of these as I cut the stems and let them resprout. With a bit of liquid feed I can keep them producing well into next spring. Outside my runners are about a foot high. Maincrop peas are only about 50% up. Maincrop carrots are just showing. Beetroot are a way off yet. Main crop onions (centurion) are about a foot high. Lots more stuff in but pretty dismal looking. We need rain!!. As for parsnips which are always a fiddling thing to germinate, I do have a crop growing. So fingers crossed.